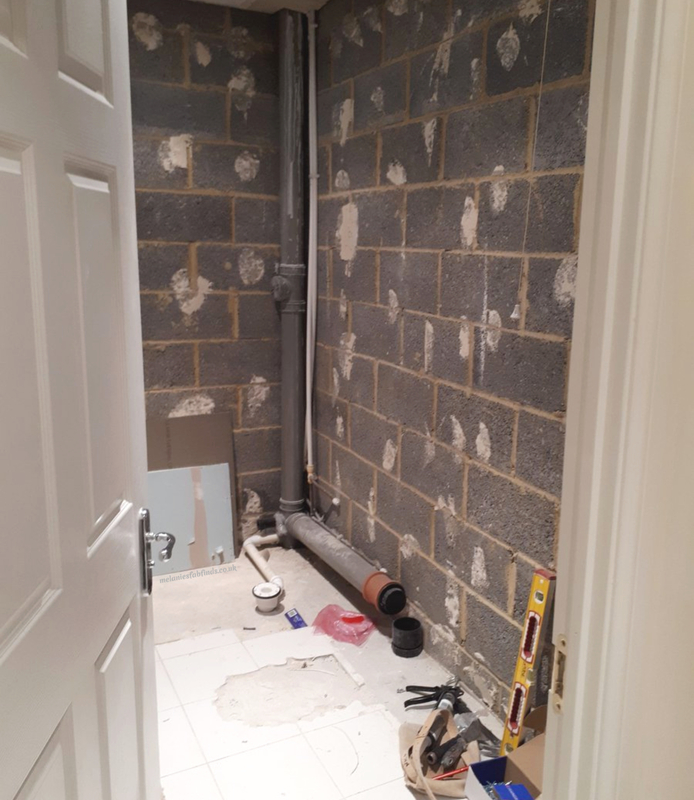 When you have family members in the property industry you tend to learn a considerable amount about all sorts relating to home renovation and decorating by default. My latest lesson or should I say topic revisited involved bathroom tiles. As a result, I decided to follow on from my recent post about kitchen tiles. I wanted to continue the topic and subsequently share a post about bathroom tiles. Many of us turn to the internet for inspiration when designing our dream kitchen or creating a luxury bathroom/spa look. can be transformed into something quite breathtaking with the addition of tiles – I’m slightly obsessed as I have always loved tiles. Tiles give a room a gorgeous luxury appearance. In a bathroom, they can make bathing a far more relaxing experience. 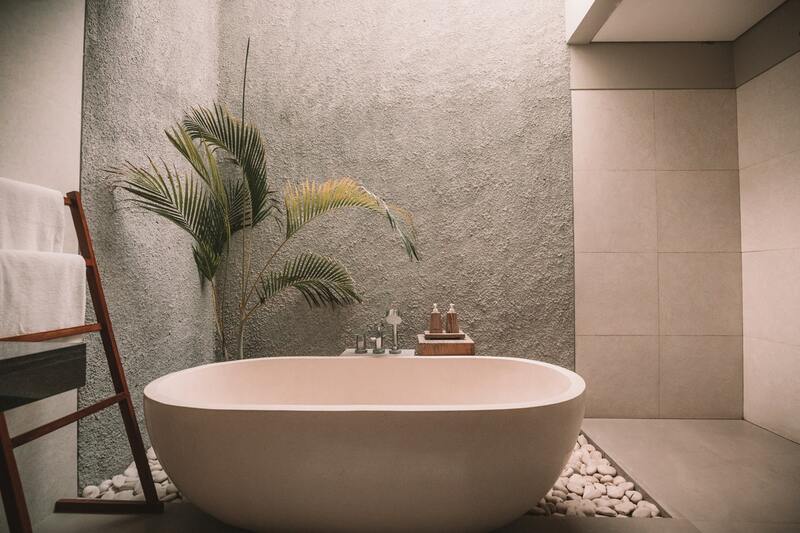 Whether you want to add a border, shower panel, or complete an all-over renovation, tiles have the power to give your bathroom an instant lift. Mosaic tiles are a firm favourite for many in bathroom decoration. They look great and are also easy to lay in any shape or formation without the need for extensive cutting. These tiles are ideal for shower or wet-room floors and are one of the most versatile tile styles available. These are available in a wide range of colours, shapes, textures and sizes so can therefore be adapted for use in almost any space. You can create a beautiful under-sea look to a bathroom perfect for any aspiring merperson by introducing shimmery neutral tiles that have a pearl-like shimmer. Alternatively, using vibrant coloured mosaic tiles can introduce a little colour to a bathroom via a border or feature wall. We often associate spa retreats with a gorgeous natural stone floor and walls. The natural variations of the stone tiles give a luxurious look and feel to a room. They also add atmosphere to your bathroom with a dramatic dark slate, or classic luxury with a marble-effect tile. Large neutral coloured tiles evoke the sun-kissed interiors of a Mediterranean bathroom making the room brighter and give the impression of a more spacious room. Whatever your taste, the versatility and beauty of natural stone will transform and enhance the appearance of any bathroom. Recent innovations in digital printing make it is possible to capture the look and texture of natural stone for a fraction of the cost. This allows for that wonderful luxurious look and feel even with a much smaller budget. These hard-wearing tiles can have the most stunning designs thus making it very popular. This stone is extremely versatile as a design material. Its affordability and adaptability make it a popular choice for recreating other tile styles. With minimal effort, we can find realistic marble, granite and urban-inspired quartz styles for a low-maintenance and stylish bathroom wall. The numerous styles available provide a nicely varied selection from which to choose. No matter how much we’d love to recreate a Swedish sauna in our own homes, a wooden floor in a bathroom just isn’t feasible. Fortunately, there is an alternative that could be considered in the form of wood effect tiles. These are waterproof, hard-wearing and also give a natural wood look and feel. Tiling bathroom walls help bring the ‘Hygge’ trend to one of the most-used rooms in our home. Lay wood effect tiles from floor to ceiling to create an all-encompassing sense of welcome and warmth. Ultimately decisions come down to budget. Within this post, I have provided plenty of options to suit all pockets. I hope this has inspired anyone looking to refurbish a bathroom. Which option would you like most in your bathroom? There are so many great choices out there when it comes to bathroom tile. We redid our bathrooms a few years ago and I’m still in love with the tile we had installed. I’m so pleased for you. It’s great to know you chose a tile type that you love. Many people are choosing the larger tiles because of less grout lines to look at and clean. A friend choose whole sheets to install in her bathroom. I like the look of all of them. Larger tiles do tend to look good depending on the bathroom style. Of the styles you posted, I find myself drawn to the natural stone tiles. Ambiance is everything when it comes to bathrooms. It’s my sanctuary from the chaos of day-to-day living. It sure is. It needs to be somewhere your mind can relax so making sure it is designed well is important. Your bathroom really does look great. That tile makes the look and a perfect way to make your bathroom makeover. I did mine a few years back but these ideas make me want to remodel again. It can be tempting can’t it to want to redo it if you get inspired elsewhere. The tiles can make all the difference. oh my gosh its amazing what a great little thing like this can do your bathroom- you’re right the tile really helps transform your bathroom to an amazing little oasis! love what you did! It does make a big difference!!! I love this! I want to re-do our bathrooms at some point. They look rather blah right now and I would want a more luxurious look. Make sure you look at using tiles preferably large ones as this should help give you the look you are going for. I would love to do something a bit different from my bathroom, at the moment we have large white ones with smaller mosaic style ones which is quite nice. A change can be nice and give a whole new feel to a room. What beautiful, stylish choices for bathroom walls! I love rooms that are completely unique with their own personalities – not just a utilitarian space. The great thing is you have so many options when using tiles. I’m obsessed with the wood effect tiles right now. I can’t wait until we buy our home so I can put those in! Those do look good in a bathroom and are very popular. I love the look of larger tiles in the bathroom, but the tiles that have a wood look have stolen my heart. I saw a bathroom with those tiles which were smaller than I usually prefer, but it just worked. With so many options it can be hard to decide. At first glance, I thought the bottom photo had a hardwood floor. Those tiles are all quite nice. Wow, what a beautiful bathroom! We are on our way to renovating our bathroom but ours is a small so we can’t do it that way. There are so many options you can use even if it’s a small room. Make sure you look at different style of tiles as they can give the room a more luxurious look. What a wonderful idea to use wall tiles. 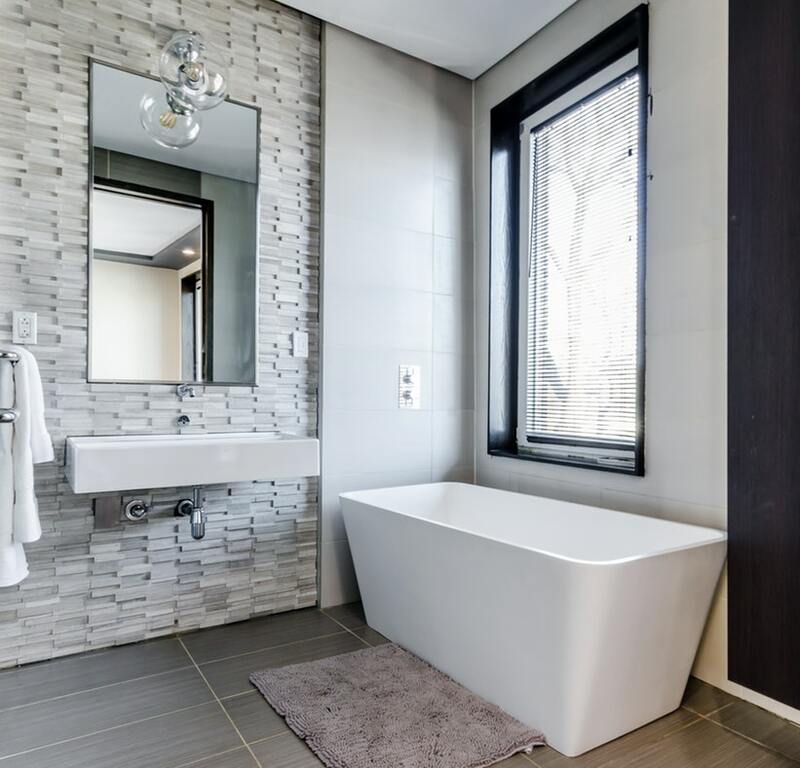 This bathroom looks so modern and spacious! I love all these awesome ideas! I think my fave is the wood effect tiles. They can look great in a bathroom!!! I have always liked the look of white subway tiles. For me, they look bright, clean and airy. So if we ever update our bathroom, that would be the look we’re going for. These are beautiful bathroom designs, I would like to have one in my house may be next time when I remodel our bathroom. I will use some of these. They sure are. Tiles make them look fantastic!!! These tiles are so very pretty. Our bathroom is definitely in need of a makeover or upgrade or something! I am always trying to look for something like this to have more idea so that when its our time to build our own house. We would already be prepared by then. I’m currently saving up to remodel our bathroom and I cannot wait! My house was once a college house so I’ve been slowly updating to make it an ADULT house. It’squte exciting isn’t it. Hope it goes well Krysten. Oh wow! That’s an impressive transformation! We have wood-look tile through most of our house and I love it! The previous owners pulled out all the carpet and put in the tile. I really wish they would have done the entire house including the kitchen and bathrooms. It looks nice but is so much more durable than actual wood. I am looking to remodel my bathroom soon. Right now, it is a bit boring. I think wall tiles would be perfect to make our bathroom much nicer! Yes, those large wall tiles definitely give the bathroom more of a luxurious feel. Plus, it’s a much better option for a high humidity environment, like the bathroom. Drywall is kind of a bad deal in bathrooms, yet most of us have that. I really do prefer large tiles for bathrooms. There is no comparison. A friend of mine has recently renovated her bathroom and has chosen the most beautiful tiles. So envious! Thanks for the tips on so many different tile choices. Will be handy when it’s my turn to renovate! It’s great to get a little inspiration from others before deciding what to do yourself. Have fun!!! Thanks for visiting Crista. Glad you found the post useful. I love the full tile look in bathrooms and it is definitely something I want when we get a house. I would love some beautiful black and white ones. Black and white tiles can look great in the home. I would LOVE to remodel our bathroom! So many things especially the tiles bother me! That’s a shame, I do hope you get to do it soon! I bet it looks amazing. Just goes to show tiles can make a room look really good! I love that natural look with that mosaic tiles. I wish I could add natural tiles to my bathroom.